born 9. September 1894, studied Law in Munich and Hamburg. His graduation in 1923 (“The consequences of guilt in the future criminal law”) was followed by an appointment as district judge in Hamburg. 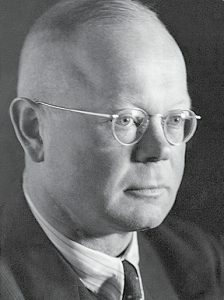 1928 Grossmann-Doerth qualified as an university lecturer with his much publicised work about “The contract-types of overseas trade”. In 1930 Grossmann-Doerth accepts a call to the German University of Prag for a professorship for civil and commercial law. In 1933 Grossmann-Doerth changes as regular extraordinary professor for commercial, business and labour law as well as civil law to the University of Freiburg (Breisgau). In his inauguration speech, which took place 11. May 1933, he talked about ‘Selbstgeschaffenes Recht der Wirtschaft und staatliches Recht’ (self created law of economy and constitutional law) and presented the core statements of his own approach – assumptions, which later on became essential for the concept of the so called Freiburger Schule. In the following years a close collaboration between Walter Eucken and Franz Böhm developed. 18. July 1939 Grossmann-Doerth is drafted for military service. He died in war on 5. March 1944. Because of his early death he was hardly mentioned in scientific literature up to now, though he can be considered as a founder of the Freiburger Schule together with Eucken and Böhm. He gave own impulses to the ordoliberal ideas and pushed the joint work within the Freiburg group significantly. Grossmann-Doerth concentrated among others things on the thought of a strong state, which is able to repel effectively private interests of single persons or groups. Further information: Blaurock, Uwe/Goldschmidt, Nils/Hollerbach, Alexander (Hrsg. ): Das selbstgeschaffene Recht der Wirtschaft. Zum Gedenken an Hans Großmann-Doerth (1894-1944).